SALE MANAGEMENT – Schacher Auction Services offers a complete sale management option that will guide you through the entire process of having an auction. From the time you decide to have an auction sale through the day of the sale I will be available to get all the steps completed in a proper and timely fashion. The process begins with a complete evaluation of the products that you plan to sell and an estimate of the value. This step is important whether it is cattle, equipment or any other product so that a budget can be established. Once the budget is established an advertising campaign will be designed. Also included is catalog preparation and production. At the sale site, Schacher Auction services will map the display of the products to sell and set the selling order. Sale order is particularly important to keep the flow of the auction positive. Clerking, settlement and transfer of goods will be promptly tended to by our professional staff. MARKETING AND MERCHANDISING – Over the years of traveling the United States in the livestock merchandising business, I have seen many different programs and ideas. This experience has given me the knowledge to organize an advertising campaign based specifically on your needs. Including design and placement of advertising, photography and public relations, we will work together to be creative in marketing your product. RING SERVICE – One of the most important parts of any auction are the Ringmen or what some refer to as bidspotters. 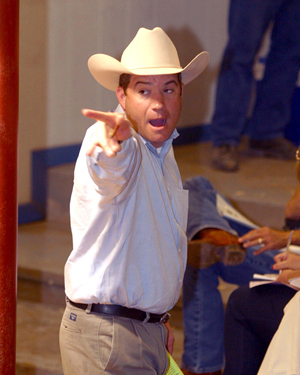 Ringmen are responsible for helping to keep the excitement up at an auction while at the same time assisting bidders. I have worked as a Ringman for several years, and I can provide you with the highest quality Ring Service available. LIVESTOCK PHOTOGRAPHY –A good picture can do a lot of things to promote your breeding program. A bad picture can draw a thousand negative words and no program needs that. Good livestock photography is essential for the proper promotion of your registered herd. Whether you need just a couple of bull or female pictures for advertising, or if you need to	fill a catalog with pictures, let me put my experience to work for you. I will make sure that your cattle photos always project a positive image of your breeding program.